The HXR-MC88 Full HD Camcorder from Sony is designed for education, government, and individuals who require a lightweight HD camera solution. The HXR-MC88 features a 14.2MP 1" Exmor RS CMOS chip with a BIONZ X image processor that can work with as little as 1.7 lux illumination in low-lux mode for sharp images. The camera records up to Full HD 1080p60 at 28 Mb/s in the widely supported AVCHD format. The Fast Hybrid autofocus system supports phase detection, face detection, and lock-on features to quickly capture sharp, in-focus images. Its fixed 29mm ZEISS Vario-Sonnar T wide-angle zoom lens features a 12x optical zoom and up to 48x digital zoom, and you can control iris, shutter, and ISO/gain via auto or manual operation. There is also a built-in neutral density filter wheel that cuts light by 2, 4, and 6 stops, allowing you to leave your individual ND filters at home. The HXR-MC88 features one Sony Multi Interface (MI) Shoe which allows the attachment of proprietary accessories, such as lights and microphones. The camera includes an XLR handle that connects to the MI shoe and provides two 3-pin XLR audio inputs with 48V phantom power. For live monitoring it has a 3.5" OLED touchscreen LCD monitor and an 0.39" viewfinder, both of which provide bright and accurate images. There is an HDMI type A as well as a multi-/micro-USB output. 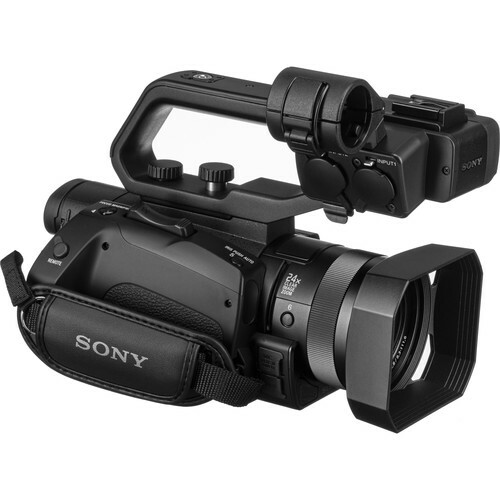 Video can be recorded to dual SDHC/SDXC card slots in relay or simultaneous modes; a Sony Memory Stick PRO-HG or PRO Duo (Mark 2) can be used in the first slot. A battery, AC adapter, lens hood, and lens cap are included. The 14.2MP 1" Exmor RS CMOS sensor delivers beautiful background bokeh defocus effects and superior sensitivity for capturing high-quality images with less noise, even under dark or bright conditions. The sensor gives you low noise and less blur because more light reaches the sensor, offering clear and steady pictures even in a dark scene with 1.7 lux minimum illumination. The MC88 integrates an advanced BIONZ X image processor to capture the full pixel readout of the sensor without pixel binning for sharp, vivid imagery. The built-in ZEISS Vario-Sonnar T lens features a 29mm-equivalent focal length when at its widest setting. The 12x optical zoom can be increased to 24x with Clear Image Zoom. In addition, the digital extender can double this range again, up to 48x zoom. A built-in neutral density (ND) filter wheel includes positions for clear, 1/4 (two stops), 1/16 (four stops), and 1/64 (six stops). This makes it easier to get all the advantages of shallow depth of field even in exterior day shoots, with no need to use a separate ND filter. The MC88 has an enhanced 0.39" 2.36 million dot OLED viewfinder and a 3.5" 1.5 million dot LCD. The high-resolution OLED viewfinder offers quality brightness, contrast, and response, giving you better control of manual focus operations and eliminating any color-breaking phenomenon. Enhanced Fast Hybrid AF (autofocus) comprises a number of features: phase-detection AF, face detection, and lock-on autofocus technology to estimate subject movement. They all work together seamlessly to capture fast-moving subjects with amazing sharpness. The HXR-MC88's intuitive touchscreen interface allows you to select an autofocus point with ease. To extend recording time and workflow flexibility, the HXR-MC88 is equipped with two memory card slots and is compatible with SDXC and SDHC cards as well as Memory Stick PRO Duo (Mark 2) or PRO-HG Duo. Relay mode automatically switches recording from the first to the second memory card when the first is full; Simul mode allows for simultaneous recording to two memory cards (for example, to create an immediate backup version). The HXR-MC88's two start/stop buttons on the handle grip and camcorder body can independently start and stop recording on different memory cards while recording in Simul mode. The proprietary Multi Interface Shoe allows the camera to talk directly to a range of accessories from Sony without requiring separate wiring. The included dual XLR handle allows two 3-pin XLR inputs with 48V phantom power to connect to the MI shoe, and can be removed to utilize other MI accessories. The HXR-MC88 features a standard 2.5 mm LANC input to remotely control focus, zoom, rec start/stop, and rec review using an optional RM-1BP or RM-30BP remote controller. The camera also features HDMI type A and multi-/micro-USB outputs for monitoring, a stereo headphone jack, and it features a built-in stereo microphone and mono speaker. Support for Sony's professional V-series battery line means it has solid battery life performance; it comes with a 7.3V, 950mAh NP-FV970A battery. The HXR-MC88 is designed to work seamlessly with Sony's optional MCX-500 Multi-Camera Live Producer, a robust and cost-effective switcher that makes it easy for one person to run a multicamera live event shoot. When used with the separately available MCX-500 and Remote Commander RM-30BP, a tally indicator will automatically appear on each HXR-MC88's LCD panel and viewfinder with a red icon indicating when the shot is live (PGM), while green indicating preview mode (PVW). The MCX-500 supports up to nine video inputs, five channel stereo inputs including XLR with both internal recording, and live streaming via Ustream, Facebook Live, and YouTube Live.